By Allan Fox: Promoter Eddie Hearn says he’s trying to work on a deal to get former world heavyweight title challenger #7 WBC Dominic Breazeale (18-1, 16 KOs) to face his fighter #3 WBC Dillian Whyte (21-1, 16 KOs) in a fight on the undercard of the Anthony Joshua vs. Kubrat Pulev card on Ocober 28 in Cardiff, Wales. For the Whyte vs. Breazeale fight to happen, Bermane Stiverne will need to move off his scheduled fight against Breazeale on November 4th and face WBC heavyweight champion Deontay “Bronze Bomber” Wilder in the main event on that card at the Barclays Center in Brooklyn, New York. Wilder is supposed to be fighting unbeaten #1 WBA Luis Ortiz on November 4, but the match is now expected to be canceled due to Ortiz testing positive for 2 banned drugs during his pre-fight test by VADA this past week. If the World Boxing Council say Wilder cannot fight Ortiz, then he’s either going to need to move off the November 4 fight date or face Stiverne on that card. “I believe it’s off,” said Hearn to IFL TV about the Wilder vs. Ortiz fight. “It’s what I’ve read. We’re looking for an opponent for Dillian Whyte. So we reached out to Haymon. Look, Dillian Whyte will fight on November 4th. ‘Oh, we’ll probably do the Siverne fight.’ We’ll fight Breazeale on October the 28th. It’s really up to whether Dillian Whyte wants the fight,” said Hearn. Breazeale, 32, is going to want to be well paid for a fight against Whyte if he’s to take that fight with just 1-month notice. Whether the fight takes place at the end of October or on November 4, it’s not much time for the 6’7” Breazeale to train for the hard-hitting Whyte. Breazeale was stopped by Anthony Joshua in the 7th round on June 25 last year in a failed attempt to capture the IBF heavyweight title in front of a large crowd of Joshua’s boxing fans at the O2 Arena in London, England. Breazeale came back from that loss to stop the hard hitting Izuagbe Ugonoh in the 5th round in a life and death struggle on February 25 of this year. It was an exciting contest with both fighters hitting the deck. We’re looking at the money,” said Hearn about a fight between Whyte and Breazeale. ”That’s a really good heavyweight. That’s what we want. We want Dillian Whyte in that fight. We’ve been talking to everybody; Lucas Browne, Robert Helenius, loads of heavyweights, we’ve made offers to. It didn’t work out for one reason or another. People don’t really want to fight Dillian Whyte. He’s a handful. But I’m hoping we can get the Breazeale fight done. That’s a really good fight,” said Hearn. Of course, the top heavyweights aren’t going to want to fight Whyte. He’s a good fighter, and it might not be worth the money that they would be getting unless it’s life changing money. You’ve got to figure that whoever fights Whyte, they’re going to likely lose. The contenders need o factor that into the equation before agreeing to take the fight. It might be difficult for Hearn to process what happens to a boxers’ career when they lose an important match, but needs to see it from the perspective of the guys that he’s asking to face his fighter Whyte. “It frees him up, but it doesn’t mean the deals going to be done,” said Hearn in talking of the possibility of Stiverne facing Wilder on November 4th, and Breazeale becoming available for a fight against Whyte. Hearn has deep enough pockets to get enough money to lure Breazeale into taking the fight with the 29-year-old Whyte. The question is does Hearn want to pay the 2012 U.S Olympian the money that he’d be asking for? It’s a dangerous fight for Breazeale to take on a guy like Whyte with just 1 month of preparation time to get ready. You must factor that in as well. It’s not as if Breazeale is a 2nd tier fighter going nowhere with his boxing career. 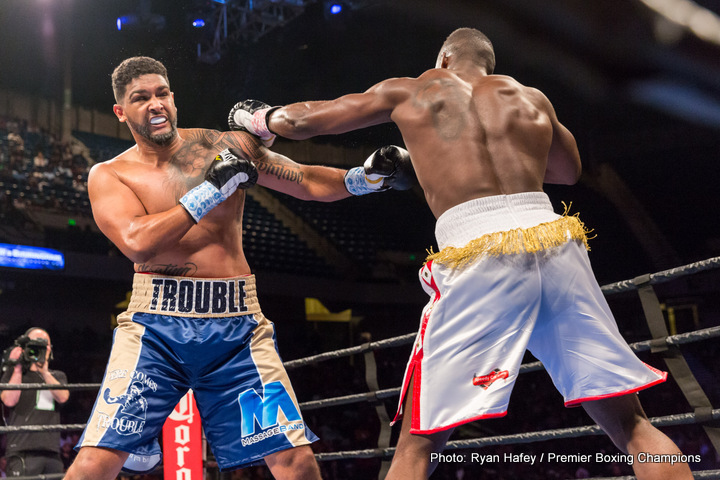 Breazeale is highly rated, and close enough to get a world title shot in the next year or 2. If Breazeale takes smaller money to fight Whyte and loses that fight, then he’ll have lost out on his chance for another world title shot. Breazeale has the size and the punching power to give Whyte a lot of problems. What we don’t know is whether Breazeale has the chin to win that fight. If Breazeale can stand up to Whyte’s big punches, he could give him a ton of problems with his own size. Breazeale isn’t a mobile fighter, and that’ a problem, because it means he’s going to need to stand and slug with Whyte for the entire fight. As hard as Breazeale hits, I think he can hurt Whyte and stop him just like Joshua did in their war in 2015. Whyte has terrible stamina, and if he’s pushed hard enough, he’ll gas out so badly that he’ll be easy to beat. Wilder still wants to fight Ortiz if he can, but it’s not looking too good right now. Wilder’s management got Stiverne to step aside so that he could fight the 38-year-old Ortiz. Wilder wanted the fight with Ortiz so he could prove to the boxing fans that he has the talent to beat the guy. If Wilder-Ortiz fight doesn’t happen, then Wilder will need to fight Stiverne due to him being his mandatory. Wilder is open to fighting Stiverne on November 4 if he can’t get Ortiz.